5 things you should know about Nigeria’s 2017 budget. On Monday June 12, 2017, Nigeria’s 2017 budget was finally signed into law after several months of the drama that has come to characterise Nigeria’s budget process. As a Twitter user put it ‘In 2016, we were looking for the budget to get it signed while in 2017 we were looking for who would sign the budget’ (fam, in 2016, the budget literally got missing!! In 2017, there wasn’t anyone to sign it as the President was abroad for medical treatment and some ‘cabal’ wouldn’t let the acting President sign it) Lol, I know I have digressed but let’s unpack this budget now, shall we? What are the 5 things you should know about the budget? 1. 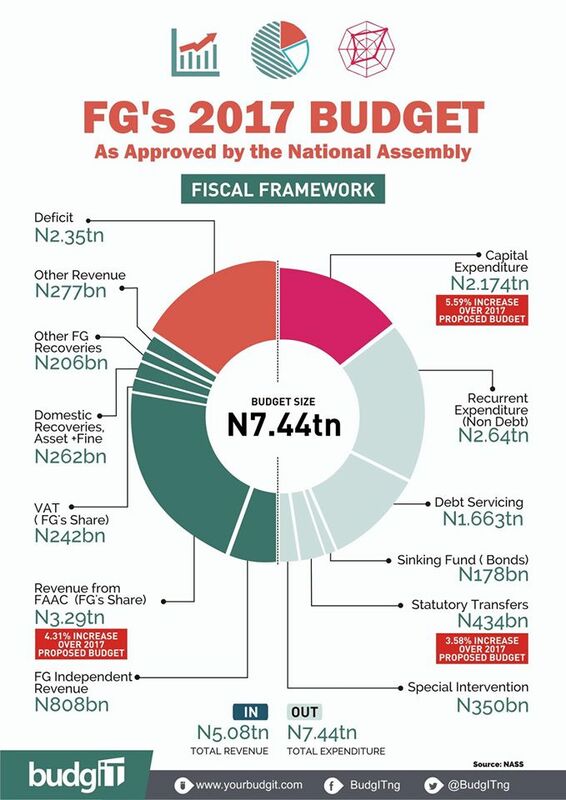 It is a big budget: The total cost of the budget is N7.44 trillion, a 20.42% increase from the 2016 budget which was valued at N6.06 trillion. 2.Revenue: The government’s income (projected revenue) is only N4.94 trillion. How do they expect to get this? Well, the government projects that oil revenue would remain at least at $42 per barrel and that oil production would be ramped up to 2.2 million barrels per day. Our 2016 experience tells us that the only variable we can control here is the production levels not the price. The recent decline in militant attacks and the passage of the Petroleum Industry Government Bill (PIGB) might assist in ramping up production levels, as for the price, we just have to pray that they remain favourable. 3. Expenditure: Total expenditure is valued at N7.44trillion. Capital expenditure – that is the amount that goes into infrastructure and suchlike accounts for about 30% while recurrent expenditure i.e salaries and other running costs accounts for about 39% of the budget. 4. Debt: As you may have noticed, with projected revenue at N4.94 trillion and total expenditure at N7.44 trillion, we have a deficit of N2.6 trillion. The next logical question therefore is how the government intends to bridge this gap. Obviously, they have to borrow, many of such plans are already underway i.e. the soon to be issued diaspora bond. Even Though, we have limited options, we need to apply caution in how we borrow and for what we borrow because N1.84 trillion has already been earmarked in the budget for debt service – that is about 37% of our estimated revenue, quite significant. 5.What I think about it: There are so many areas of concern which immediately jumps at you whilst examining this budget vis- a- vis our current economic predicament. Implementation: Not only is it such a huge shame that this budget was passed ridiculously late, its sheer size and the corresponding deficit makes one wonder just how much of it would actually be implemented. To put this in context, in 2016, only 59% of the N6.06 trillion budget in 2016 was implemented, one therefore wonders the extent to which this N7.44 trillion budget would be implemented. Recurrent expenditure: After all the noise that has been made by this administration about the elimination of ghost workers and increasing public sector efficiency, it is pretty alarming to see that almost 40% of the budget would be spent on recurrent expenditure which adds no value to our economy. Debt: Nigeria’s debt stock is increasing and currently stands at N19.16 trillion! this is alarming as it excludes the debt that will arise from this budget. Like I always say, the problem is not borrowing – truth is, we are too broke not to borrow- but it is how we are going to use the money! I have no faith in this administration whatsoever so I really pray that I am proven wrong. We need finer details on the specifics and timelines of how every Naira in the budget would be spent. We need proof that the returns on these investments will improve the lives of future generations rather than jeopardise it. Previous What’s hot?!! Vol.1 – June 12, unemployment data, debt etc.